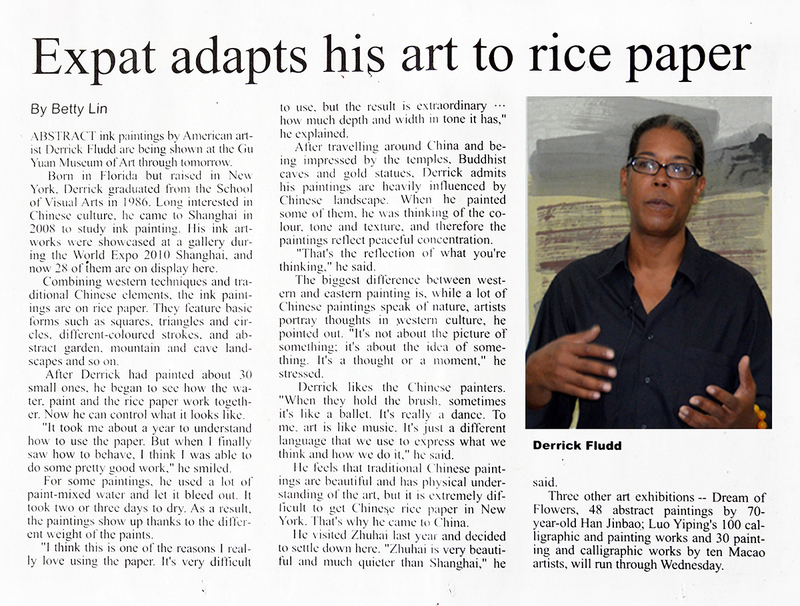 Yesterday, four art exhibitions opened at the ancient Yuan Museum of Art in which "foreigner" abstract Ink by remarkable American artist (Derrick Fludd). 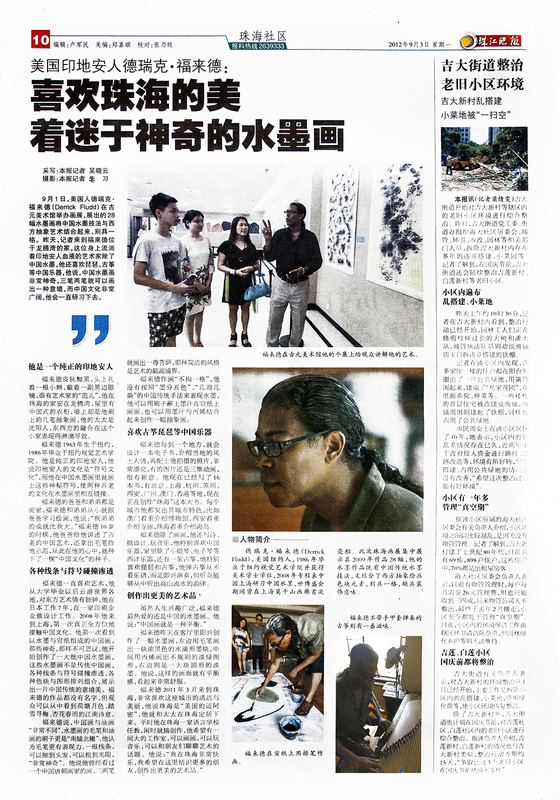 Gu Yuan Art Museum has on exhibit 28 works on paper from 2009. According to reports, Fludd is from New York, graduated from the School of Visual Arts in New York in 1986 and obtained a Bachelor of Fine Arts. In 2008, he moved to Shanghai, China his debut in Shanghai was at Moganshan Smart Art galleries. Now Zhuhai is showcasing 28 of 2009, works in Ink both traditional Chinese ink-painting techniques, but also blend Western abstract painting elements, large-scale and refreshingly unique. On the same day, Gu Yuan Museum exhibition also features three other exhibitions: "Dream of flowers - Hanjin Bao abstract painting exhibition," Luo Yiping calligraphy and paintings exhibition "Mirror Sea pickers the 10 Letter art exhibition". It is reported that, "Flower Dream - Hanjin Bao abstract painting exhibition on display the famous painter Han Jinbao 48 works. Hanjin Bao Routeburn Center of North Carolina State University visiting professor, member of the Chinese Artists Association, the Chinese Artists Association Mural Arts Council members. Luo Yiping Painting and Calligraphy Exhibition "on display nearly 100 pieces of Luo Yiping calligraphy and paintings, Luo Yiping Jiangxi the Jinxian people, Dr. Fine Arts. "The mirror sea cockle ten Letter Exhibition" on display include two categories of Chinese painting, calligraphy 30 different styles, from different angles to show the audience the Huang Fengwen huangnan, Xu Yongzhi, off the right-chang, Xie Ge, Huang Kailu Zhaowei Fu, Wu Zhijie Liu Fu Yip, Deng Mingwei ten the Macau famous painting original works of art unique charm. showcasing 28 of 2009, works in Ink both traditional Chinese ink-painting techniques, but also blend Western abstract painting elements, large-scale and refreshingly unique.